A Portaferry school has said that a plan to merge it with three other schools in Downpatrick has ended. St Columba's College said the Council for Catholic Maintained Schools (CCMS) had confirmed the decision. 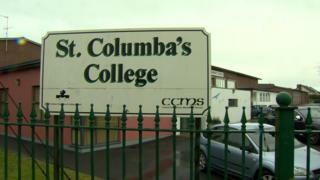 In a statement to BBC News NI, CCMS said that although St Columba's had been withdrawn from the proposed amalgamation, it was still exploring whether the school was sustainable. Plans to amalgamate St Columba's were announced by the CCMS in 2018. Parents at the Portaferry school had expressed concern over transport issues for pupils if the merger went ahead. In its statement on Tuesday, CCMS said: "CCMS and the trustees will progress with the development proposal to amalgamate the three Downpatrick schools, reflective of the trustee vision for the Downpatrick area. "CCMS and the trustees remain committed to ensuring that all children and young people have access to sustainable, high quality education." Under the original plan, St Columba's would have amalgamated with De La Salle High School, St Mary's High School and St Patrick's Grammar, all in Downpatrick. The new school would have had about 1,600 pupils. Parents in the area had expressed mixed opinions about the proposal. Many of those in Portaferry were concerned about how about 170 pupils there would cross Strangford Lough every morning if the merger went ahead as planned. They said there was not the capacity on the existing ferry service to take all of the pupils to any new school on time. In a statement on Monday night, St Columba's said it had now been told it would not be amalgamated with the other three schools. The school included a statement from CCMS in its announcement, which said the decision had been made after extensive consultation. "CCMS and the trustees have concluded that unique challenges face pupils from Portaferry in terms of requiring additional ferry places to transport pupils to Downpatrick," it said. "As a result, CCMS and the trustees are withdrawing St Columba's College, Portaferry, from the proposed amalgamation."